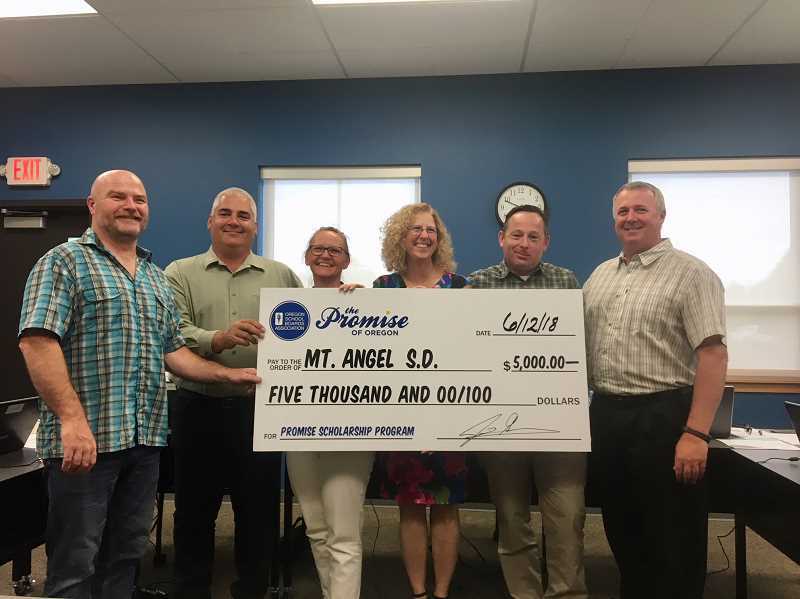 Mount Angel School Board is one of three Oregon boards that was selected to receive a $5,000 check for local student scholarships by the Oregon School Boards Association. The award was presented at the June 12 Mount Angel School Board meeting. The board decided to award two scholarships in the amount of $2,500 each to Molly Jaeger and Jonathan Valladares Cormier. The other two qualifying school boards are Yamhill Carlton and Athena-Weston. The boards qualified for the funds under an OSBA initiative known as the Promise Scholarship Program. Board members completed a multi-step process including board governance professional development, a board project, and superintendent and board self-evaluations. Steve Kelley, OSBA's director of board development, said each of the boards had made a long-term investment in students' success. "This program helps students both by providing scholarship funds and investing in board member training," Kelley said in an OSBA press release. "Stronger boards are better prepared to face today's education challenges." Selected boards are responsible for awarding student scholarships to one or more students by a method of their choosing. A full description of the program can be found at http://www.osba.org/Programs/BoardDevelopment/Article/PromiseScholarship.aspx.